Add 1-1/2 cups cold milk to 1 pkg. (4-serving size) Jell-O Vanilla Instant Pudding in medium bowl. Beat with wire whisk until well blended. Refrigerate 5 min. Gently stir in 1 cup thawed Cool Whip Whipped Topping. Tint with a few drops of green food colouring, if desired. Spread evenly onto tops of cupcakes. 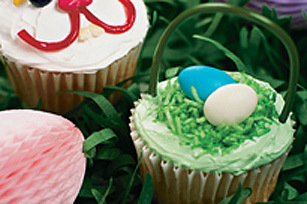 Decorate each cupcake with shredded coconut, miniature chocolate eggs, and licorice to resemble Easter baskets. Store in refrigerator. Place 1/2 tsp. water and 2 to 3 drops green food colouring in small resealable plastic bag. Add 1 cup shredded coconut; seal bag. Shake gently until coconut is evenly tinted. For a darker shade of green, add 1 to 2 additional drops of food colouring to bag. Seal bag and shake gently until coconut is evenly tinted. Pour the cake batter into large resealable plastic bag. Snip off 1 corner from bottom of bag and squeeze the batter into paper-lined muffin cups. It's much quicker and less messy than spooning the batter into each cup.